D&D-? do you play role playing games as well? I really like Oblivion and have been dabbling with Gothic III when I have the time. I have never "played" D&D..BUT I have been a Dungeon Master once or twice! the kilt and...hmmm...welll...I'm a bit not sure what to think about that!!! I don't really have any hobbies, just spending time with my 4 kids ( 1 girl- 14 yrs: 3 boys - 4yrs - 2 yrs - 1 yr and all with irish/scottish names) when I'm not working. But have several intrests... Star Wars fan, listining to celtic/celtic rock music. recently starting reading up on celtic history. And the #1 intrest lately is wearing a kilt (purchased my 1st one a month ago). If I had four kids, I can imagine being thankful for having sleep as a hobby! Cool, diverse bunch we have here! Me, well... glassblowing ceased to be a hobby last year, now I'm a full time glass artist. I know my way around a kitchen quite well and I love to feed people. I really like to putter around the yard and make stuff grow, mostly crabgrass it seems. I'm a complete music junkie and have played tuba for 35 years. Oh, and I've got two Moluccan Cockatoos, Quimby and Cosmo... or as I like to call them, my psychotic stepsons, heheh. Interests:Camping, hiking, music, homebrewing, motorcycle riding, and way too many other things to list here. I have recently started geocaching (thank you Rygar). Some favorites are camping & hiking, and hunting and fishing. 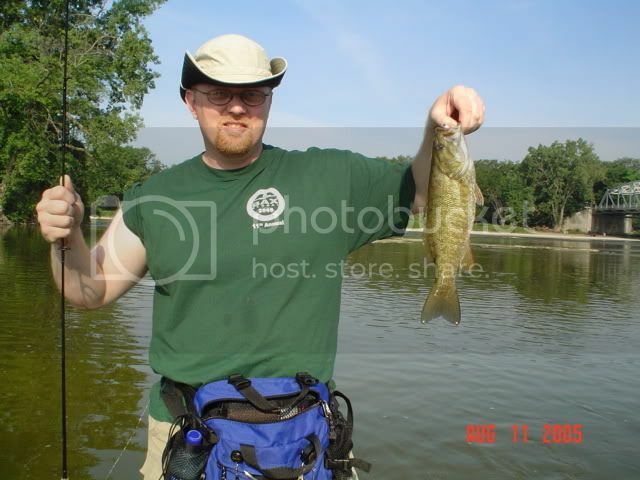 I primarily enjoy deer hunting (bow, shotgun, and muzzeloader), and fishing for smallmouth with ultralight (4lb test line) gear. 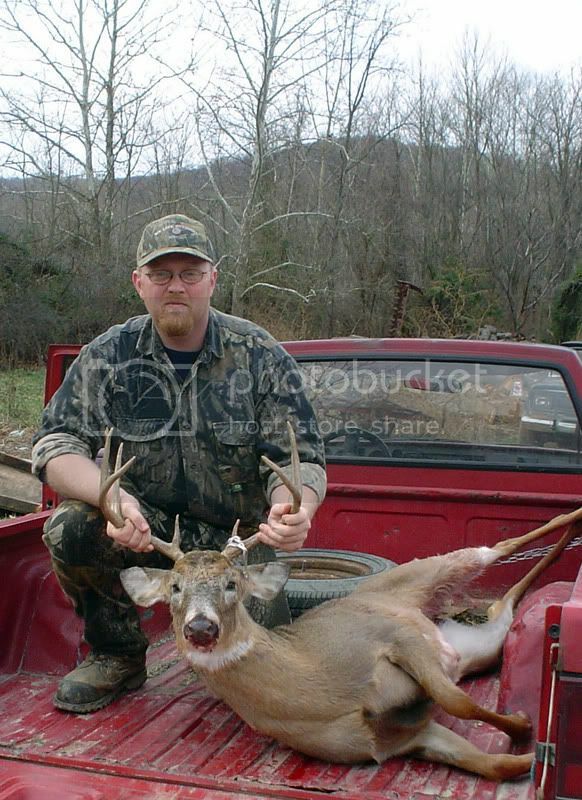 this years shotgun season - 8 point. I also enjoy motorcycleing. 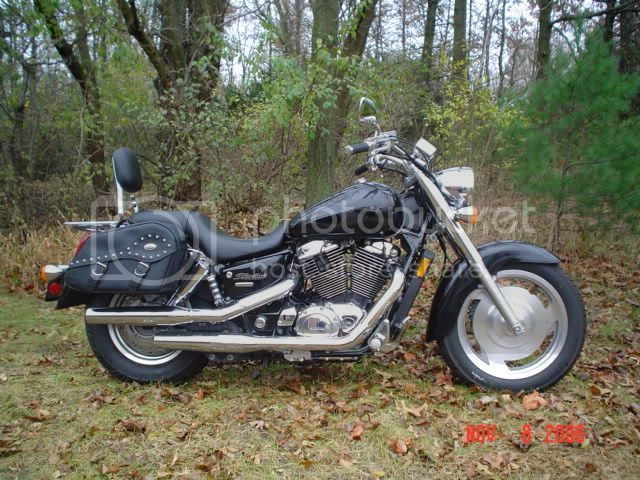 Here is my 2004 Honda Sabre 1100. If you look close you can see the ghost flames in the paint. Other hobbies include homebrewing, model railroading (N Scale), reading, and listening to music. Instruments that I play?????? I guess that owning them doesn't count as playing them. I own three quitars. An Ibanez Blazer electric and two acoustics. I am ashamed to say I can;t play a single thing on them :oops: . Three guitars and can't play a riff? Dude, how did you come upon the guitars???? I swapped an friend some extra stuff I had for the Ibanez electric. I didn't have the time or money at the time to take lessons. The Epiphone acoustic was purchased when I started taking group lessons. They were really cheap. Long story short, I was about 16 yrs older than the next oldest student. I quickly realized that you can only go as fast as the slowest student. After a month I decided to stop the lessons. The third guitar is a classical accoustic that was owned by my brother. He gave it to me about a year before he passed away. I do plan on taking lessons sometime soon. I am in the beginning stages of job hunting and relocating closer to my family in southern Ohio. Once that happens, and I am settled in, I want to start. Currently my hobbies are extremely limited by space and draconian firearms regulations. However if I had the space they would be working on my '67 Nissan Patrol, reloading/following the school of Wiley E Coyote School of Gunsmithing (WECSOG) and reading. These will hopefully come to be in late august or early september, assuming I can find a job quickly. I ride my Harley,I have since I was 15 years old and I'm 40 now.I also like to shoot,go out and go muddin in my 93 Jeep Wrangler,and play music.I have been a banjo picker for 15 yeaars and a guitar player for 12.I also play the madolin and the dobro just a little.I have been playing the harmonica for as long as I can remember.I also enjoy lifting weights. sounds like all kinds of fun...have you mastered your marksmanship while picking the banjo at 20 mph sunk up to the door in mud and belting out some willie nelson yet? No KT not yet.I am working on it.Actually I am trying to find someone in my local area that teaches BAGPIPES.I thought that I would give it a try.I really enjoy the sound of pipes. Hey Korn, Scruggs or Uncle Dave Macon/Grandpa Jones style? Am jealous you know! My banjo has abusted tuner on it so it just sits now..lazy me will fix it one of these days :roll: btw, I do a little frailing myself..
here is a list of some bagpipe instructors in Georgia..not sure how close these are to you, but it is a start! you can also contact the Altanta Pipe and Drum band, they may have some info for you. K.T. I appreciate the link to the instructors,but alas,they are almost 4 1/2 hours away.Maybe I can find one closer.I will not quit until I get what I want. DrLewall,I mostly play Scruggs and Dr Ralph Stanley style banjo.Never tried to play like Grampa Jones. i have alot of hobbies i guess... too many to do any of them justice. - i camp with a Hennessy Hammock. - so i got paid to do living history, but i have also done it for fun (mostly rev war era). - i was a stagehand in a former life and so i still dabble in lighting design and sound engineering (do that stuff for my church now). - i love Star Wars, Star Trek, and Lord of the Rings. - i do web design on the side; and for my day job i am a database programmer. So, since I didn't see this before, I guess I should add my 2 cents. I enjoy listening to music and watching movies. Netflix is a God from above. I don't have too many hobbies. I used to be part of a couple of Hot Air Balloon crews when I lived in Pennsylvania, but haven't had any luck finding balloonists here in NC. As noted above, I used to be in the Boy Scouts and used to do some grand hikes and camping. I'd like to get back into it a little more. I used to hike and camp....got old and moved to Wisconsin, might change that before to long.. whoa!!! that is awesome! wow.. it is like chaotic hang-gliding. i'd love to give that a try someday. well most don't go that extreme. There are those who buggy using a 3 wheel vehicle. There are also those who ATB (off road skateboard) and have a blast. Those are the main ones... but I'm like a kid. Anytime I find something new and interesting I dive in head first. make sure there is plenty of water in that pool before you dive in!